There’s a saying that chicks dig the long. Early in the spring of 2014, the chicks are hitting the long ball. Softballs have been flying over fences with great frequency in the first few weeks of the season and there have been some impressive team and individual performances. In our preview article, Quad A Sports noted that the Canon-McMillan lineup would be a daunting task for opposing pitchers. Perhaps they are even more ferocious than originally thought. In the span of four days the Big Macs broke the team record for most home runs in a game twice. On March 28, Canon-Mac opened its Section 4 schedule with an 18-3 drubbing of Brashear and belted five home runs in the process. Just days later, the Big Macs broke the single-game mark again with eight round-trippers in a 17-3 win over Chartiers Valley. In the game against CV, freshman Brittany Crawford, and seniors Olivia Lorusso and Ally Bellaire smacked two home runs apiece. Lorusso finished with a 4 for 4 day and six RBI. Collectively, Canon-McMillan has hit 17 home runs in the first four games of the season. In an individual display of power, Plum’s Hannah Adamski opened the season with a three homer performance in a 9-0 win over McKeesport on March 27. The sophomore has followed that up with two more bombs in each of the next two games for a grand total of seven home runs in just three games. To put that in perspective, Adamski was 5 for 11 with six RBIs during her freshman season. In 10 at bats this year, Adamski has eight hits and seven are home runs. Also a standout swimmer at Plum, Adamski has 12 RBIs already this season. A career home run record fell at Hempfield this week. Senior Kasey Kolick (in photo above courtesy of Dana Rukse Photography) broke the Spartans career mark with her 10th home run on April 1, part of a 4-3 Section 1 victory over Norwin. Kolick surpasses Lauren Lyle on the school’s all-time HR list. Lyle hit nine home runs at Hempfield from 1995-1998 and remains atop many of the offensive lists in school history. Round-trippers were not restricted to the softball field as several Quad-A baseball players have flexed their muscle in the early going. Arizona recruit J.J. Matijevic (in photo to left) belted a home run in a 4-3 Section 2 loss to Hempfield on March 31, and jacked two more the next day during a 14-10 non-section win against the reigning WPIAL champion North Allegheny Tigers. Matijevic finished with a five RBI day against the Tigers. North Allegheny’s Mitch Machi clubbed a grand slam against Norwin in a remarkable offensive showing by both teams. 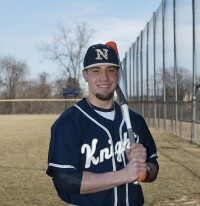 In the aforementioned 4-3 win for Hempfield on March 31 over Norwin, the Spartans used three long balls to outlast the Knights in eight innings that day. Joey DeFloria and Eric Loucks connected for solo shots, but the most momentous blast came from Dom Mori who stroked a game winning two-run homer in the top of the eighth inning. In another exciting one-run game this week, the Pine-Richland Rams edged the Seneca Valley Raiders for a 6-5 win on April 2. It wasn’t a home run that won the game but instead a walk-off, bases loaded single by Daane Berezo that broke a 5-5 tie and propelled the Rams to victory. It was a non-section win for Pine-Richland, but the Rams and Raiders will be section rivals again next season in Section 1 thanks to realignment.